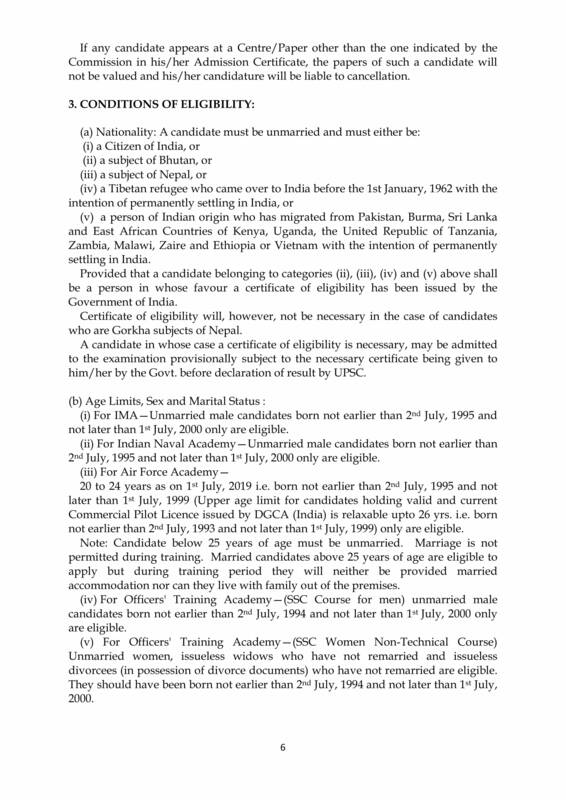 For IMA—Unmarried male candidates born not earlier than 2nd July, 1995 and not later than 1st July, 2000 only are eligible. For Indian Naval Academy—Unmarried male candidates born not earlier than 2nd July, 1995 and not later than 1st July, 2000 only are eligible. For Air Force Academy—20 to 24 years as on 1st July, 2019 i.e. born not earlier than 2nd July, 1995 and not later than 1st July, 1999 (Upper age limit for candidates holding valid and current Commercial Pilot Licence issued by DGCA (India) is relaxable upto 26 yrs. i.e. born not earlier than 2nd July, 1993 and not later than 1st July, 1999) only are eligible. For Officers’ Training Academy—(SSC Course for men) unmarried male candidates born not earlier than 2nd July, 1994 and not later than 1st July, 2000 only are eligible. They should have been born not earlier than 2nd July, 1994 and not later than 1st July, 2000.